Maitreyee Bhattacharjee Chowdhury is a Bengaluru based poet and writer. She has three books to her credit – ‘Uttam Kumar and Suchitra Sen: Bengali Cinema’s First Couple’ (non fiction), ‘Where Even the Present is Ancient: Benaras’ (poetry) and ‘The Hungryalists’ (non fiction). In the year 2013, ‘Uttam Kumar and Suchitra Sen: Bengali Cinema’s First Couple’ was nominated for Crossword Book Awards in 2013. Maitreyee is organiser of Bengaluru Poetry Festival, and poetry and fiction editor of The Bangalore Review, a literary journal. Maitreyee’s writings can be found in journals both national and international. She lives in a house with a family of dogs and poetry. 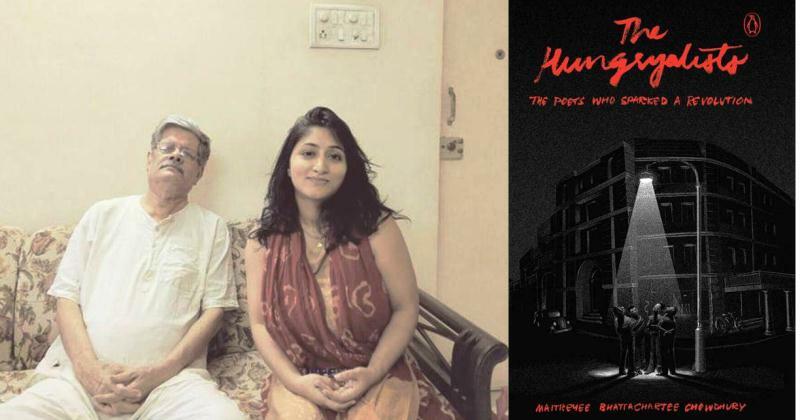 In an exclusive interview with Bengaluru Review, Maitreyee shares her experiences with writing her latest book, ‘The Hungryalists’, which chronicles a poetic revolution in Bengal during the ‘60s. Let’s start on a lighter note. In the Preface (Introduction) to the book, you mention that some poetic licence has been taken with the romantic angle in Malay’s (Roy Choudhury) life in the interest of the book being in the format of narrative non-fiction. How much or to what degree that poetic licence has been taken, and was it done from the viewpoint that a non-fiction title can generally be taxing keeping in mind the general readership or that amidst the chaos, the commotion of the Hungryalist movement, this aspect of the narrative would bring some sense of calm to the storytelling? The form of narrative non-fiction allows some creative license in the presentation of the narrative. In an attempt to make the book more interesting, I used some of this creative licence in the description of Malay’s love interests. I wanted the characters to be alive for the audiences for which details about them had to be understood from intuition from the description given to me by Malay and others. There were no photographs or detailed descriptions that I could fall back on while describing the characters, hence how Naseem Appa bent over Malay while making love to him or Tara’s interest in travel was up to me to describe. The letters between Malay and Tara are also part of that creative licence used to highlight the nature of their relationship. The degree of poetic license in the book is in its presentation. The framework of the story and its many nuances, events, anecdotes, letters between the Hungryalists themselves and the other characters like Allen Ginsberg are all factual. Amongst the initial members who formed the Hungry generation, Malay is still alive. You’ve interviewed him several times as you were writing the book. Tell us something about him, his temperament as a poet, his philosophy as an artist, something which might not be known from any book(s)? Malay was extremely helpful and warm throughout the journey of this book. He extended every possible help to me and the book would have been impossible without his generosity. I haven’t seen him in the act of writing, but I found him extremely aware of the poetry scene both in Bangla as well as English. What many might not know is that he is extremely sharp even at his age, prolific as a reader and very internet savvy – something that is rare for people his age. In Chapter 1, it is mentioned that Haradhan Dhara, one of the keys members of the Hungry generation had adopted the name Debi Rai, and the same was printed in the first printed Hungry manifesto because he was a Dalit writer living in the slums. What do you have to say about issues like these in context to our present times? How difficult is it still to get published especially by a big brand for an upcoming writer who hails from such a background? I don’t think the caste of a writer matters today, at least I haven’t seen or felt any such thing in the world of Indian English writing. In fact writers belonging to such castes, who might have something different to say or add to the regular narrative probably stand a far better chance of being published today. But today the issues that affect the Indian English writer are somewhat different. There are open discussions on social media amongst writers about class barriers amongst other things. Having said that I’m not very familiar with the scene in vernacular writing, hence can’t comment on that. To quote a couple of lines from Chapter 5, “Bengalis are anyway a timid race, and when attacked physically, the intellect in them is puzzled about the necessity of action.” Your comments? No book is complete without something of the author or his/her observations creeping in. In this case the observation is laced with a sense of humour. Like every other race I’m allowed to criticise my brethren and myself. Thankfully Bengalis do have a sense of humour and I hope they’ll take these observations in the right spirit. In the book, Malay is quoted casually saying, “If poetry did not show the way, what else would?” In the context of our current establishments and state of affairs, how much or how much do you not agree with this? In every age, poetry has shown the way. This stands true for the present circumstances too. Contrary to what publishers keep telling us about poetry not being popular, I see more and more people turning to poetry. It is solace, direction giver and home for the lost soul. Let’s talk about Ginsberg (Allen). It seems that he as a literary figure along with his chronicles during the ’60s in India served as big a role as probably, let’s say, letters from Malay’s love interest to string the narrative of this book together. Your comments on that? The role played by Allen Ginsberg in this story cannot be wished away by anyone. He plays a rather large role in highlighting the cause of the Hungryalists to the Western media and literati. I wish to set this record straight once and for all here to all the fans of the Hungryalists too, Ginsberg’s role as far as the Hungryalists are concerned is one of generosity and camaraderie. Acknowledging that role does not take away from the Hungryalists their fame, innovation and spirit. Success sometimes lies in taking everyone along. In a broader perspective, what do you think have been the outcomes of anti-establishment movements in poetry and literature like these, the A-Kavita movement in Hindi literature and of course, the Hungryalist movement in Bengali, both of which drew inspiration from Beat poetry and its generation? I think the biggest contribution of any of these movements whether in India or outside is to show to people what can be possible with literature, how it can be moulded to give rise to new language, diction and emotion and gain new territory. It is the nature of all creative art to find the new, to add perspective to what has already been said and to evolve- in that sense and more literature has only gained from these movements. If you were asked to define what poetry means to you in a single word, what would it be?